If you are looking for how to configure your 9mobile apn setting for android or 9mobile apn settings for blackberry. 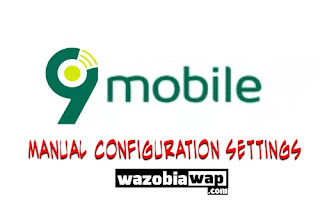 This article contains 9mobile manual internet configuration settings and how to configure it. As we all know that Etisalat was rebrand to 9mobile and some times not every device will be able to receive the 9mobile automatic configuration. So for you to be able to use any of the 9mobile data plan you have to configure your 9mobile apn settings. That's all you need to know about 9mobile internet settings and how to configure it. You can use the above method to activate 9mobile internet settings for android, 9mobile internet settings for modem, 9mobile internet settings for blackberry and lots more. Stay tuned for more information.